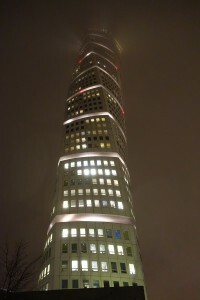 The November cycle of APL User Meetings is kicking off; the SWEDAPL meeting in Malmö was first this year, holding a meeting at the top of the famous Turning Torso in Malmö. 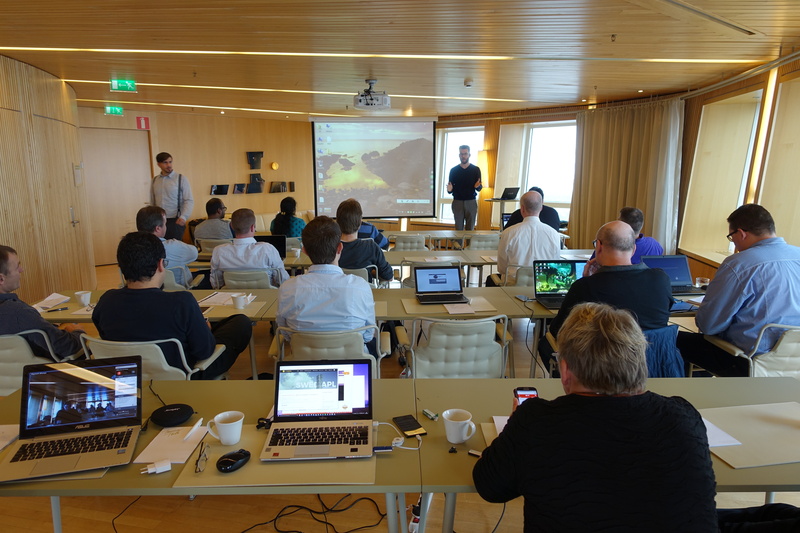 Since it was just a short trip from our Danish office, Dyalog was represented by Gitte Christensen, Bjørn Christensen and Morten Kromberg – with Brian Becker and Dan Baronet joining the meeting remotely. Next week, Richard Smith and Nick Nickolov will be representing Dyalog at APL Germany in Erfurt and Dan Baronet at FinnAPL in Helsinki – check http://dyalog.com/dates-for-your-diary.htm periodically for a list of APL meetings and Dyalog presentations! This turned out to be a very international group – ten Swedes (two of whom were from India but based in Göteborg), six Danes who made the trip across the sound, two from the UK, one German and one delegate from each of Serbia and the Ukraine – plus about five North Americans who joined the afternoon sessions via GoToMeeting. This was the first “themed” SWEDAPL meeting; all of the talks were related to the use of Web Services in APL. First up was our host Gilgamesh Athoraya from Data Analytics in Malmö, who showed us how he had been using Paul Mansour’s new RUMBA application interface which is built on top of Dyalog’s TCP toolkit (which is known as CONGA). Gil has been experimenting with support for Web Sockets, which are bi-directional connections that allow the server to push data to web client applications, making it possible to have very responsive user interfaces in web applications. The last talk before lunch was by Stephan Poßberg of Vallourec, who talked about the use of Web Services to make computational code available across a large, global organisation. 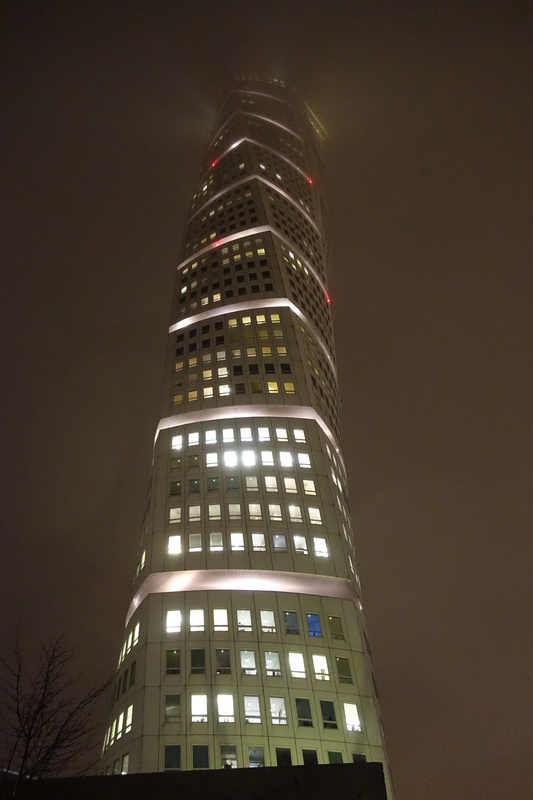 Lunch was served on the 54th floor; unfortunately the weather didn’t quite allow us to see all the way to Helsingør. After lunch, it was Morten’s turn, assisted by Brian Becker (who joined the meeting from Rochester NY) to present Dyalog’s brand new support for RESTFul web services, available in MiServer 3.0. Paul Mansour also joined this session and provided valuable insights into REST technology, which seems to be taking over as the preferred Web Service architecture for new applications. Finally, Peter Simonsson from Aplensia in Göteborg told us how Web Services had become widespread at Volvo Cars, where a couple of hundred APL-based services provide the backbone of a network of applications centered around product data and production planning – with the earliest web services dating back to the days when APL ran under VM on IBM Mainframes. Many thanks to Gilgamesh, Data Analytics and Optima Systems for arranging this event, which provided much food for thought, and inspiration for future work by several people at Dyalog – and by the sound of it, a number of users of APL as well! Expect to see more support for Web Services and Sockets in future versions of Dyalog products! This is exciting – I hope you can see why I am “over the moon” (apart from Selene being the Greek Moon Goddess). One of the good things about modern User Interfaces based on markup languages like HTML is that logical information about the user interface is available at runtime. For example, a browser displaying HTML maintains a “Document Object Model” of the web page. The content and other attributes of each element within the DOM can be inspected and manipulated at runtime by a testing tool – this is what Selenium does. Selenium is a widely used open-source tool for automating browsers, with growing support from browser vendors. Selenium provides an API that allows you to perform just about any operation that a user could: click on buttons and select items from drop-downs, press keys to enter text, drag and drop items, or perform exact mouse movements and different types of clicks. Over the last few weeks, we have been working on a some thin covers for Selenium to make it easy to drive browsers from Dyalog APL. At the moment we require the Microsoft .NET bindings and can only do the testing from Microsoft Windows. The web server can be running anywhere, and we hope to add other client platforms in the future. The primary motivation for this work has been to create regression test scripts for MiServer version 3.0. The MiServer regression testing mechanism is extremely simple (possibly a bit TOO simple, we’ll cross that bridge later): If a site contains a folder called “QA”, and the folders within mirror the structure of the web site, then a mechanism exists to load each page in turn and run the corresponding test function. You can read more about it on GitHub and see it working in the video at the top of this post. 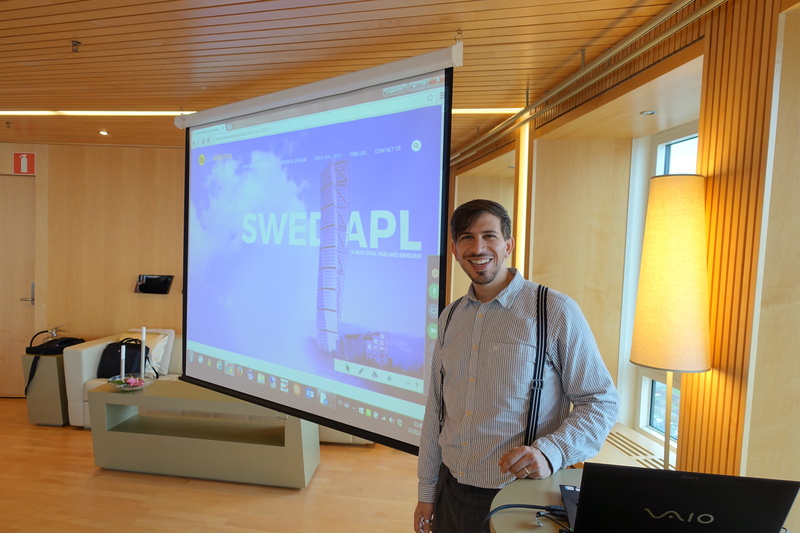 One of Sunday’s tracks was Brian Becker’s engaging workshop on MiServer 3.0 – the newest version of Dyalog’s APL-based web application framework that allows you to develop a cross platform application for stand-alone use or delivery via the web. The motto of MiServer is that everyone who can develop an APL application should also be able to make it available via the web, allowing users to access the application via their favourite browser. In other words, MiServer is browser and platform agnostic. The main take-away from the morning’s workshop is that if you are used to developing your GUI using ⎕WC, developing the GUI in MiServer 3.0 creates some slightly different rules. First we were showed where to download MiServer, and then Brian guided us though building out very first one-page website. 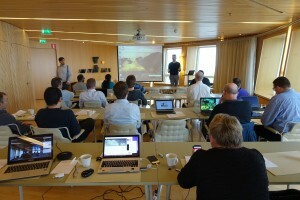 The interactive nature of the workshop captivated us all. Before we knew of it, it was time for lunch. After lunch – instead of having a sleep inducing talk, Brian challenged us to build a website for a Big Brian’s Burger Bistro offering ordering facility for various products with side orders, and a dashboard to monitor the ordering, product category, speed of order processing, and – most importantly from a management point of view – keep an eye on revenue and which products generate most revenue, with auto update when new orders where processed and paid. It may have been down to the eating habits of the delegates in terms of their love for burgers, fries etc., but the enthusiasm with which we attacked the challenge was probably more due to how Brian managed to whip up and present MiServer 3.0’s capabilities during the morning. Actually, we got so engrossed in the afternoon that we almost missed our coffee break! A group of participants was tasked with creating a dashboard, and after some discussion decided on two tables, which would pull data from the business logic, do a bit of calculation, and auto update when new orders got processed. 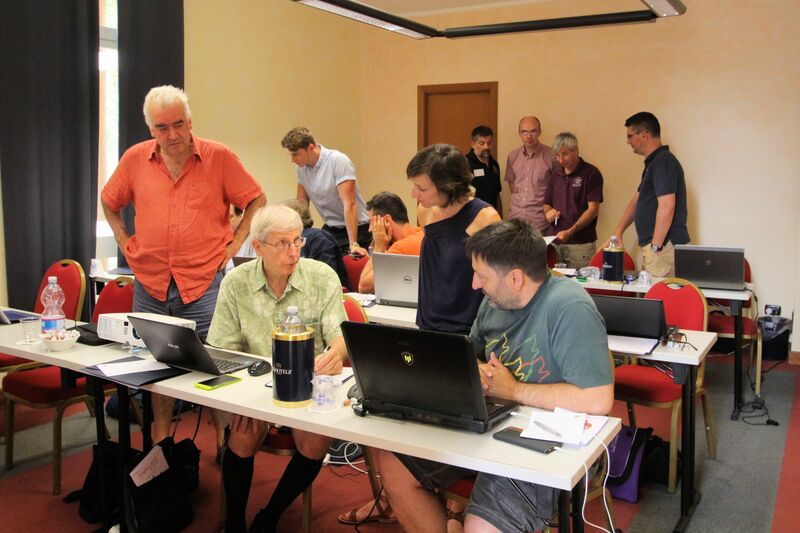 Hugely entertaining, and we actually managed – courtesy of Rick Proctors swift keyboard handling and deep understanding of APL – to get the code for the dashboard done, working and showcased before we ended the workshop. We are all looking forward to the MiServer UI Controls presentation on Tuesday morning where we will get a chance to see some the many fancy widgets that MiServer 3.0 offers. Regular readers will remember my whining about the poor precision of both infra-red and ultrasonic sensors. But today, the Raspberry Pi / Dyalog APL – controlled “DyaBot” was observed driving on a dinner table – where the slightest navigational error could mean a 3-foot plunge and certain death! How can this be? The answer is: the “PiCam” finally arrived last week!!! The parameters rotate the image 90 degrees (the camera is mounted “sideways”), set the size to 60 x 80 pixels (don’t need more for navigation), take the picture immediately, and store the output in a file called “ahead.bmp”. 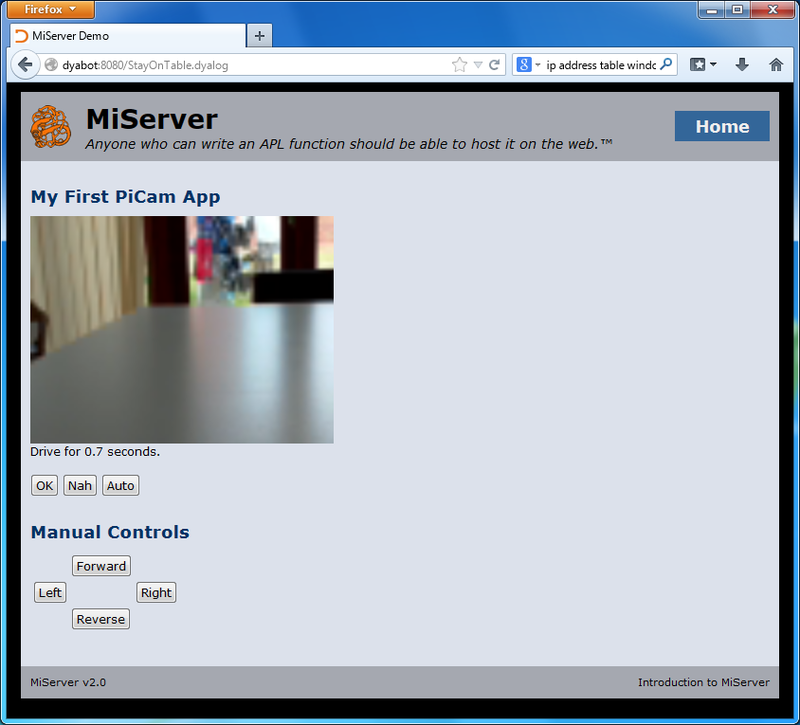 (Documentation for the camera and related commands can be found on the Raspberry Pi web page.) Despite the small number of pixels, the command takes a full second to execute – anyone who knows a way to speed up the process of taking a picture, please let me know! The above gives us a 60 by 80 by 3 matrix containing (R,G,B) triplets. This code assumes that BMP file is in the 24-bit format created by raspistill; I will extend the code to handle all BMP formats (2, 16 and 256 colours) and post it when complete – but the above will do for now. 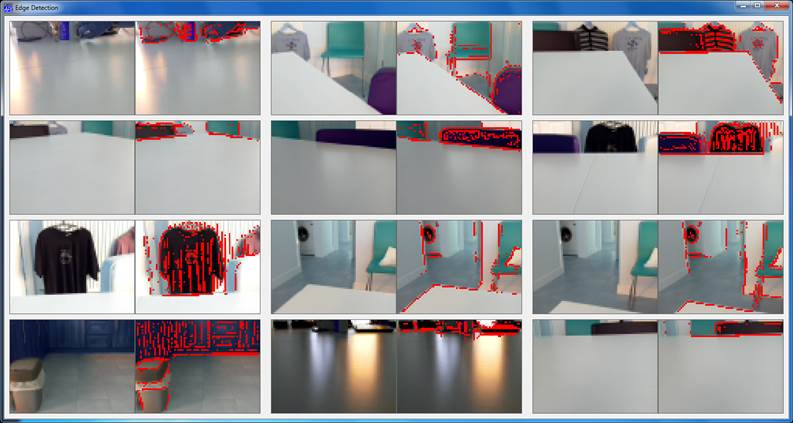 At Iverson College last week, I demonstrated the DyaBot driving on a table with a green tablecloth, using code which compared the ratio between R,G,B values to an average of a sample of green pixels from one shot. Alas, I prepared the demo in the morning and, when the audience arrived, there was much more (yellowish) light coming in through the window. This changed the apparent colour so much that the bot decided that the side of the table facing the window was now unsafe, and it cowered in the darkness. Except for the image at the bottom left, where the bot is so close to the edge that the table is not visible at all (and the edge is the opposite wall of the room, ten feet away), we seem to have a reliable tool. 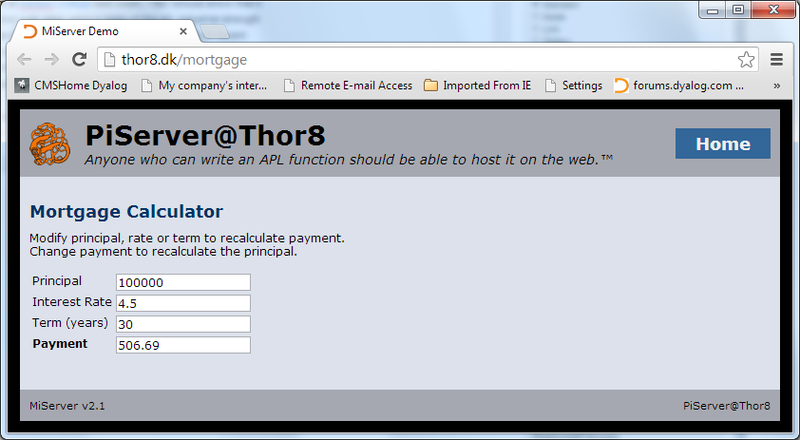 The code to drive the bot is embedded in a “PiServer” (MiServer running on a Rasperry Pi) web page. Each refresh of the page takes a new picture, extracts the bits, and calls the main decision-making function. The suggested action (turn or drive straight ahead) is displayed in the form, and the user has the choice of pressing OK to execute the command, pressing the “Nah” button to take a new photo and try again (after moving the bot, changing the lighting in the room, or editing the code). There are also four “manual” buttons for moving the Bot. After testing the decision-making abilities of the code, brave programmers press the “Auto” button, allowing the robot to drive itself without waiting for confirmation before each command (see the video at the start of this post)! The central decision-making function and the kernel computation function are listed below. The full code will be uploaded to the MiServer repository on GitHub, once it is finally adjusted after I find a way to attach the PiCam properly, rather than sticking it to the front of the Bot with a band-aid! Note the similarity of AK to the APL Code for Conway’s Game of Life!